Happiness is a warm mug....of coffee. 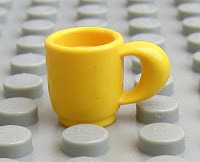 Today begins as so many others do with a cup of Roasterie Coffee- the only difference is that I'm drinking it out of an outstanding minifigure mug with my name printed on the side. Fresh from the LEGO store at the Mall of America, a friend has bequeathed me the finest gift I've received in quite some time. Tiny cartoon, pirate minifigures exhort me to drink more caffeine. Today is one of the days I wish for colleagues as my canine and feline coworkers do not yet possess the capacity to ask me about the quirky new mug, thus allowing me to launch into a soliloquy about the world of LEGO. But you can trust that coffee without sugar has never tasted so sweet.